I just have to say that I am SUPER happy with my Superfood Memebox! It's so funny how one box can be so good and then another box be so.... well... meh. This one, however, while it didn't have any Skinfood in it (sadness!) does have some excellent products in it. I think I went a little nuts at one point. This must have been when those $10 and $15 Memepoint codes were out because this month has been one Memebox after another for me. I got two yesterday and two more today. This particular box was $9. Yeah. SO worth it! The regular price is $23 plus $6.99 shipping. If you haven't checked your account(s) lately, you might want to do that. One of mine got 5 Memepoints for being inactive. Who knew not buying Memeboxes could also be lucrative?! Anyway! On to the box contents. I'm REALLY excited about this Memebox. **RESTOCKED** Get it HERE! Wow, that sold out fast! LadyKin Essence Toner in Broccoli-150ml- This says its got 90% broccoli extract. It doesn't smell like broccoli! It smells really good. Niacinamide and sodium hyaluonate are in the top five ingredients! Woohoo! You always knew green was good for you, right? Actually this isn't green at all, the bottle is just tinted that way. I also am loving the method of... use? It reminds me of those Cutex Nail Polish Remover dispensers. You press on the top with your cotton pad covering the holes and voila! Broccoli goodness and the ultimate hydrating, antioxidant, dark spot fading awesomeness of this Ladykin toner is yours! Love. 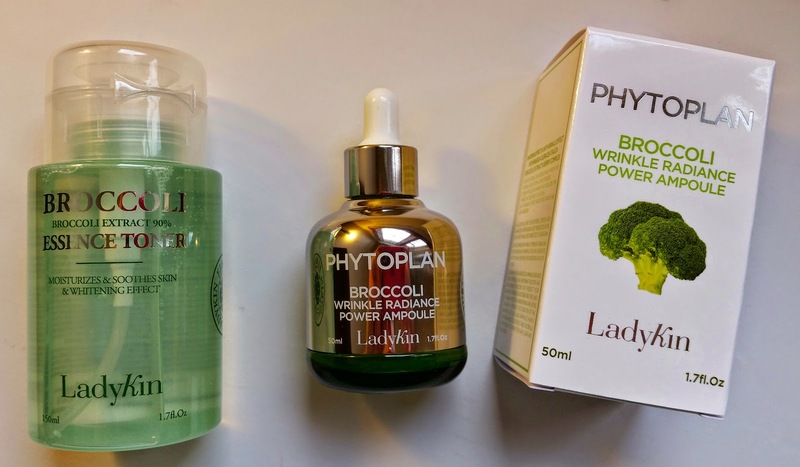 Ladykin PhytoPlan Broccoli Wrinkle Radiance Power Ampoule-50ml-This also has broccoli extract as well as niacinamide and sodium hyaluronate. Such good stuff. It also has some fantastic antioxidants other than broccoli in the forms of raspberry, blueberry and blackberry extracts. This also smells really good. It's got sweet almond oil and shea butter in it as well. I'm just so happy to see two wonderful products with no lavender whatsoever! Yay! 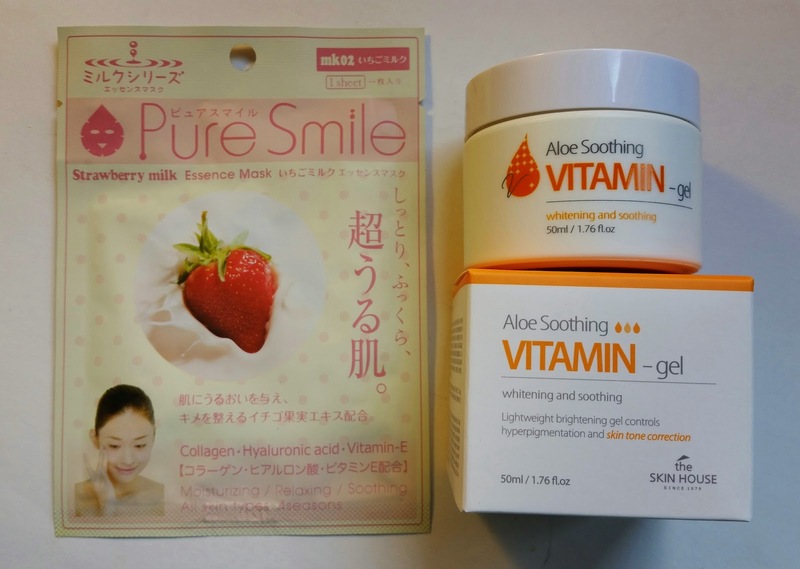 PureSmile Strawberry Milk Essence Mask- Formulated with collagen, hyaluronic acid and vitamin E this is pack with nutrients. There's also milk proteins and wild berry extracts to strengthen and protect your skin. I admit when I saw PureSmile again after the disaster of a Vitamin Care box, I was a little sad but this actually looks good and I'll use it. I just have my ritual complaint of how I wish there was at least two included. There should always be more than one mask, imo. The Skin House Aloe Soothing Vitamin Gel-50ml-This doesn't have the full ingredient list but it does have the Key ones listed. It's got niacinamide, aloe Barbadensis leaf extract, tomato, honeysuckle and peony extract and vitamins B6, B2, B1, C and Folic Acid. I should have taken a picture of it. It's got the typical aloe green gel type consistency but it also has little gold balls that disappear into your skin in it. It's got a very light scent that I think is pretty pleasant. Secret Nature From Jeju Peeling Gel-150ml- Made from volcanic clay, natural cellulose components and Jeju from Jeju island, this is 97% pure, raw and derived from nature. It has a gentle yet effective formula that will exfoliate any excess dead skin cells and impurities while brightening your complexion for velvety soft, clarified skin. Jeju is a volcanic island and is part of South Korea. So the components for this product came right from there! I really like my Snail Grommage Peeling Gel so I'm excited to use this. If it has any of the effects of the Origins Charcoal mask, I'm going to be really happy! VERDICT: In case you couldn't tell, I'm loving this Memebox! I'm at an age where ingredients are important to me. I want ingredients that work, that can be absorbed by my skin and provide a real benefit. 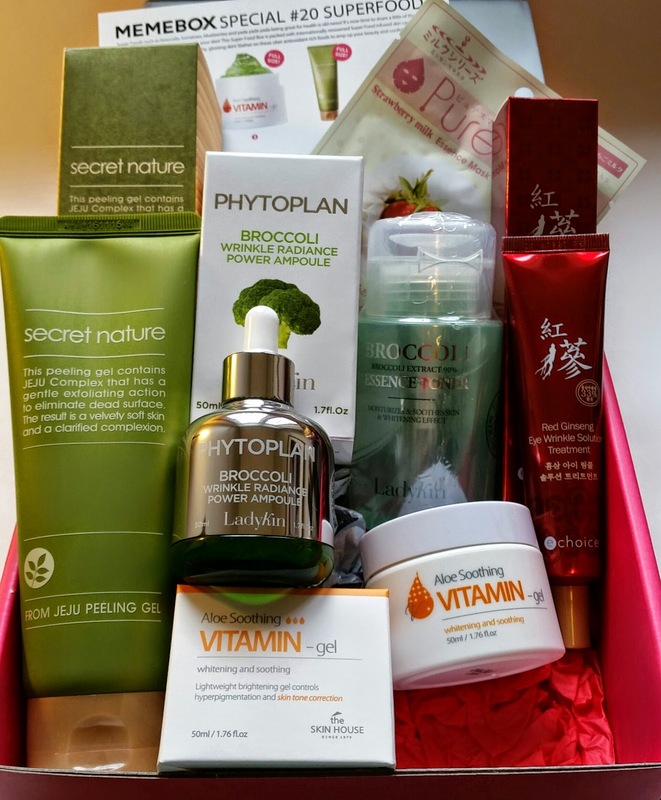 I've discovered that Korean cosmetics tend to be more natural and contain more (and in higher concentrations) of the ingredients that can actually have an effect on your skin. So when I see things like niacinamide, I get happy. When I see it high on the list, I'm happier! I want to have an even complexion and niacinamide works to fade scarring left by acne, dark under eye circles and also age spots that you might get, even on your hands. Don't forget your hands in your daily rituals! They need moisturizing, too! Hyaluronic acid is always a wonderful ingredient. We produce this naturally but as we age, production slows down. It can *however* be absorbed by the layers of our skin! For your face, that means tiny lines and wrinkles can disappear as your skin soaks up the water that hyaluronic acid holds. It's so good! Antioxidants are also important in skincare. Whether its from broccoli or blueberries or straight vitamin C, it doesn't matter. We need to keep nutrients in our skin and keep free radicals out! Antioxidants help with that. So, I love this box because the ingredients are so good! Yes, there's two ladykin products, yes, they're both broccoli. Yes, there's a PureSmile mask and there's only one. But on the scale of 1-10, this box rates at ten for me because of effective, useful products in an array of types. Theres a peeling gel, an essence, a toner and a moisturizer. And a mask. I'm looking forward to incorporating these into my skincare routine. OMGOSH everything in these box looks so goood!! I'm sad I didn't get it. From your expertise from the experience of having gotten so many Memeboxes, do you have any predictions for which currently available boxes may be great like this box (rather than duds)?? I would love to hear your opinion! 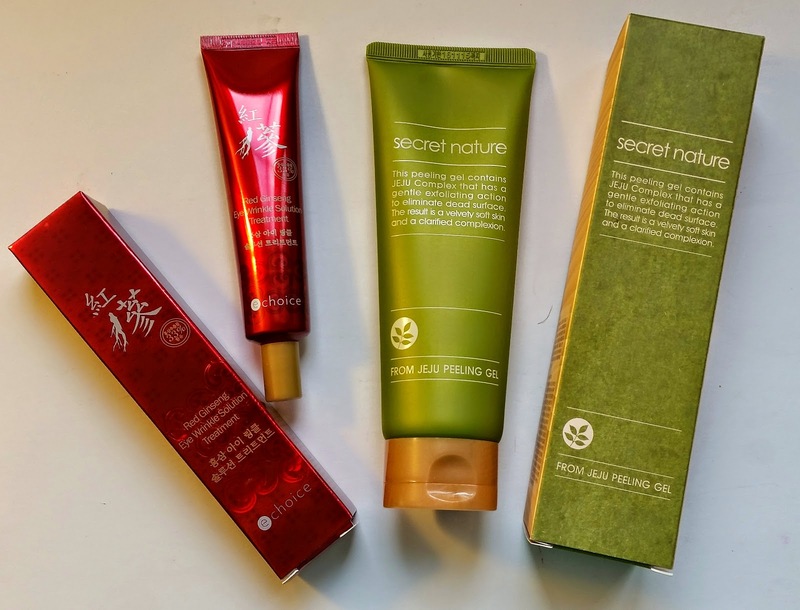 Right now, I'm trying to decide between the new Mask box, Moisture Surge, Earth + Sea, Yogurt, or Whole Grain 2.... I want to get 1-2 MAX and am having a difficult time deciding..haha help! It's so hard! I got the Earth and Sea because I'm hoping for some great clay masks and marine algae essences. I think I want the Yogurt one because the Milk one was so good and I didn't get it. Whole Grains made everyone happy and I didn't get that either! I think you probably can't go wrong with a Mask box. I've liked mine. So right now I want Mask #4, Yogurt and I'm debating the Sleeping Beauty. The description on that is SO vague and when I emailed Memebox about it and whether it would have actual princess items in it or not, they just said oh, we can't tell you. Which means no princess items, it's just what they're calling the box. Oh, I got the moisture surge one, too! I figure how wrong can they go with moisturizers, right? I'm hoping for a facial mist in that one, too. The duds that I got were Hair and Body 2 and 3. So don't get the Rapunzel one, whatever you do! Oh, and Vitamin Care was a dud. Your best bet is probably Mask (if you want masks!) and from there.... All we can do is hope the ones we picked are good! I would say Moisture Surge would probably be "safe", Earth and Sea might have some crazy/interesting stuff and Yogurt I think will have some good fermented, gentle skincare in it. Whole Grains was kinda boring but useful and everything was basically oatmeal so that's why I'm not getting the second one. hahaha, I love your response! Thank you so much for taking the time! :-) I agree that Mask is probably the best bet, because I LOVE masks (and who can ever have enough right?) and I often force my boyfriend to do them with me (although one time, he claimed the mask broke him out! haha oops..), so I am heavily leaning towards that one. But knowing me, I'll probably end up getting either the Yogurt or Earth + Sea... or Moisture Surge! See, you helped me eliminate Whole Grains sand the Rapunzel which I was eyeing.. haha. Oh, and by the way, I totally caved yesterday and bought the Sleeping Beauty one! I'm hoping that they'll go for QUALITY sleeping packs rather than cutesy-princess-ey stuff. Lol, their email was so vague.. This is how enabling works, I tell you the ones I want and got and then you tell me. Now I'm thinking I *should* get Sleeping Beauty! I mean, you did... So, I should, too, right?! Haha! I want some points. If I get points, I will get Sleeping Beauty. And... yogurt. I agree with you. It's hard to trust the categories now because one-use items are not full size! Don't feel bad for ranting. You are right!